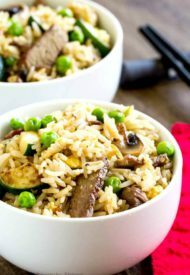 This steak fried rice is a delicious way to use leftover steak and rice for a new and exciting meal. Leftovers never tasted this good! If you follow me on snapchat (shineshka), you know how often I make fried rice. Pretty much any time I cook rice for dinner, you know we’ll be having fried rice the next day. In fact, I purposefully cook extra rice! Sometimes I make it as a side dish, or other times I throw in some protein and make it a main dish. One day, I ended up with an extra steak, not sure how that happened, but it did. And I just happened to serve it with rice. 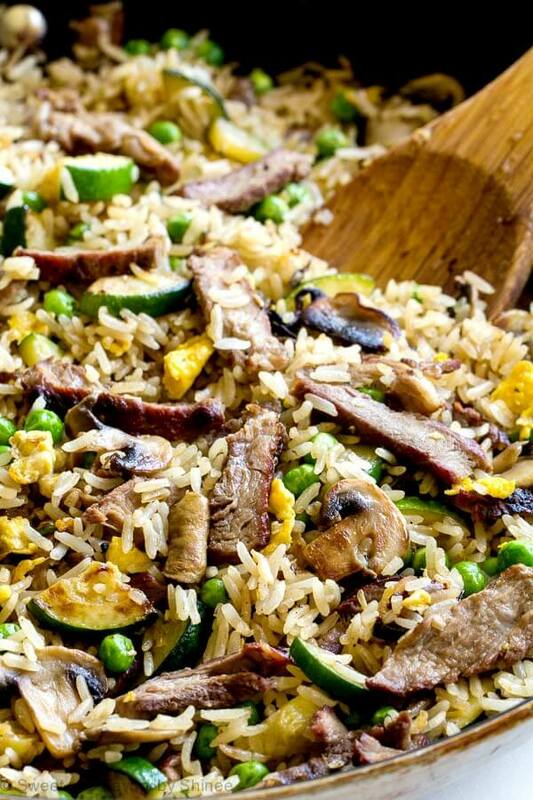 And you guessed it, I made steak fried rice the following day. Since it turned out so good, I decided to share it with you. And if we’re really honest though, I wanted to eat it again. And what’s better excuse than cooking for the blog?? Since I’ve shared the key points for perfectly fluffy and flavorful fried rice in my vegetable fried rice post, I won’t repeat myself here. 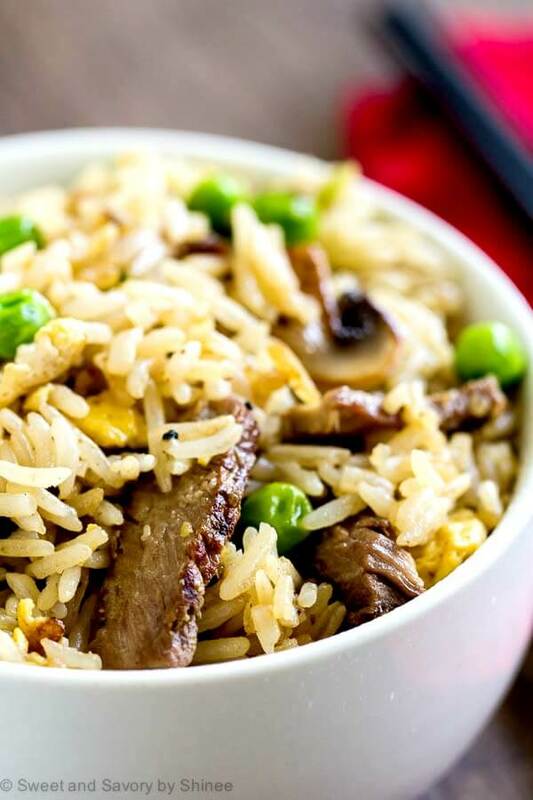 But in short, you don’t need a wok to make delicious fried rice. However, I highly recommend using a day-old cooked jasmine rice. Short grain rice tend to be stickier, which isn’t ideal to make fluffy fried rice. And just as any rule is made to be broken, I love using zucchini in my fried rice. I adds freshness and doesn’t make the rice soggy, because you cook it well, drawing all the moisture out, before adding the rice. Sesame oil is my main secret though. No matter what kind of fried rice I’m making, I always add sesame oil. It’s just not the same without it. I live for that toasty, nutty smell of sesame oil. This Kadoya Pure Sesame Oil is what I use. It’s rich, nutty and, most importantly, flavorful! A little bit goes a long way. Whenever I drizzle some sesame oil, Garrat asks me if I’m using sesame oil. He loves it too! If you use a different brand and find it a bit on milder side, feel free to add more. 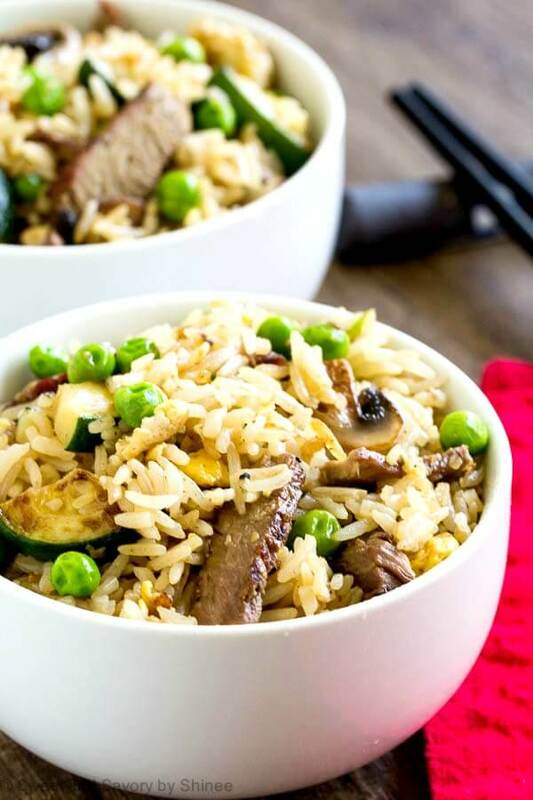 Hope you’ll cook extra steak and rice soon, and enjoy this fabulous steak fried rice the next day! Cut the mushrooms and zucchini into uniform pieces. In a large non-stick skillet, heat olive oil and add minced garlic. 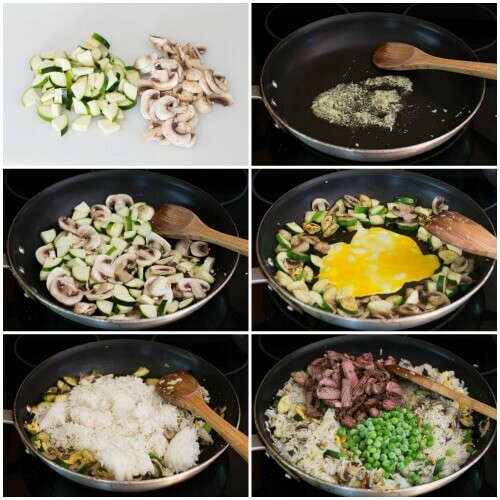 When fragrant, add mushrooms and zucchini. Cook for 3-5 minutes, or until nicely browned and softened. Push the vegetables to the side, and add the beaten eggs. Scramble the egg until mostly cooked and mix with the rest of the vegetables. Add rice, stir everything and cook for 2-3 minutes. Add sliced steak and peas. Stir in the soy sauce and sesame oil. Mix and cook until everything is heated though. Serve immediately.